I am planning on applying for a solo show in the near future at my local community gallery. The exhibit will be about my experience of Sunshine, in the last 18 years, we moved here in 2000. Initially when I thought of the idea I imagined I would have plenty of imagery. Well after 3 or 4 sessions printing, not so many it seems. This will impact on the timeline for when I exhibit and which dates will suit me. Here are 18 prints chosen so far. By my calculation 20 to 25 would be a more desirable number. This means more shooting, not a bad thing, I’m just surprised at how few good images I have? This thoughtful writeup of one of my favourite photobooks is pertinent as I prepare for the upcoming exhibit I am participating in that has been organised by Gary. 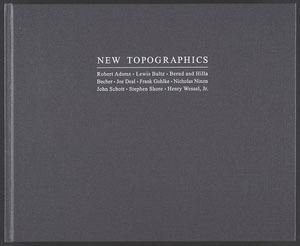 In 1975 at the George Eastman House an exhibition was curated by William Jenkins, assisted by Joe Deal, on what was then evolving as the new (urban) landscape photograph, titled New Topographics; Photographs of a Man-Altered Landscape. You could argue that what now remains is history. Okay, but why?